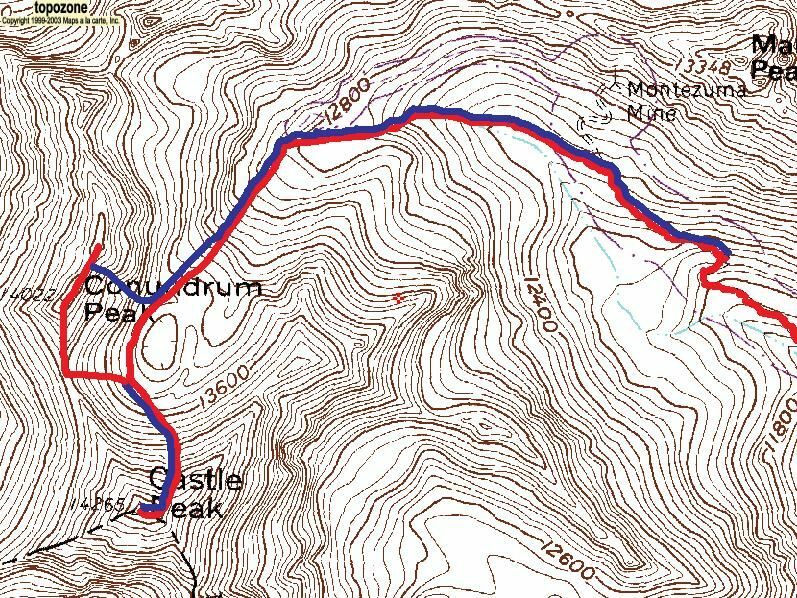 Adam Sotkin, Julie Struble, Luke Kroiss & I hiked/skinned up to Montezuma Basin, then climbed Castle Peak's North Couloir. We were able to ski from the summit with only minor billy goating. The snow was heavily wind-affected, but still good enough to hold an edge on. The maximum slope angle in the couloir was about 40 degrees. Luke and I gained the Castle Peak-Conundrum Peak saddle and followed the ridge of to the top of Conundrum Couloir. I quickly ascended the summit, then we made our way down the couloir. The snow had a thin suncrust that could have been easily avoided if we were on it earlier. The maximum slope angle in the couloir was about 47 degrees and the choke about 180 cm wide.